Thanksgiving guarantees two things each year to us here at EWBG: eating way too much and a trip to the Los Angeles Auto Show. Over the last few years, the LA Auto Show has started to become one of the large auto shows that people actually pay attention to with manufacturers revealing new concept models and production ready cars in one of the largest automotive markets in the US. With each year, the number of new reveals increased along with the popularity of the test drives that manufacturers offer to attendees. With each successive year, more and more manufacturers set up tents and booths outside the LA Convention Center to allow show goers a chance to sample their latest wares. Let us take a look at some of the cars that we saw at the show this year, as well as some of the cars we test drove. To see all of the photos we took from this year's show, click on over to our Photo Gallery page. Without a question the single most exciting vehicle to make its North American debut at the show, the Giulia signals Alfa Romeo's eminent return to the United States mainstream after more than two decades of absence. Having built up anticipation with cars like the 8C and 4C, the addition of a proper entry-luxury compact is an exciting proposition, especially one sporting the sumptuous curves of the Giulia. Under the skin, the Quadrifoglio sports a twin turbocharged V6 engine with 550-hp and the wail of a whole gaggle of unbridled banshees. This thing not only sounds badass, it claims the fastest time for a production sedan around the Nurburgring, proving that it has the performance to back up the exhaust sound. While the mainstream Giulia sedan will certainly be much more tame on the performance front, it should carry much of the performance DNA through to do battle with the likes of BMW and give the 3-series a serious battle for top sport sedan honors. Not exactly normally exciting stuff, but with such a global presence, Buick is going to be a staple of the GM stable for many decades to come. That means cars, like this totally redone and dramatically improved Buick LaCrosse is an extremely important car to most of the world, even if to Americans it is going to be mostly an also ran in the category. That sad reality is quite unfortunate because most Americans are going to miss out on what appears to be a stellar car. Sharing a platform with the very excellent Chevy Impala, the new LaCrosse brings tauter, more sophisticated styling both inside and out and should offer a more premium feel than its platform sibling. If I had the money, I would snag a whole fleet of these guys in black metallic paint to be used as livery cars or to rent out to eager Uber drivers looking to offer a more luxury feel to their passengers. This may be the only way to get more Americans to experience this brand. The rumors were true: Mazda's Miata did indeed spawn a return of the Fiat Spider. This classic Italian roadster with its rounded headlights, simple tail, and open air motoring experience is supposed to represent a distilled essence of roadster ownership. The use of Miata underpinnings means that on the driving front, Fiat is going to be able to deliver in spades. However, the new styling feels frumpy and incongruous compared to the clean simplicity of the classic and the interior's lack of anything resembling Italian flair comes as a tremendous disappointment. Combine that with the muzzling of the 500 Abarth's raucous exhaust note and there is nothing but unmet expectations surrounding this reveal. Tried and true, the Civic is a car sold in mega volumes so when a new one is released, people pay attention. Having learned from the mistake of the 9th generation car, the new 10th generation has been a runaway hit with both the motoring press and the general public. Reactions to the new sedan's sporty proportions, use of a turbo motor, and stunning interior redesign has almost everyone clamoring for more. 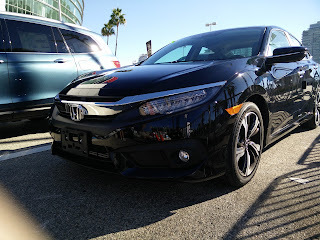 So when Honda took the wraps off the all new Civic coupe, I was disappointed to discover that the new design did not translate as nicely to the two-door body. Somehow, the long hood/short deck proportions that make the new sedan look exciting and fresh fail to translate as well when applied to the shorter wheelbase of the coupe. No matter to me as I would be interested in the sedan over the coupe anyway. A warmed over GLA wearing Infiniti drag, the QX30 feels like a totally disingenuous attempt by both Mercedes and Infiniti to foist upon the world more copies of a car that is going to feel like a disappointment to the people who buy it. In some ways, the QX30 is really a GLA for those people who are smart enough not to buy into the pretentiousness of a three-pointed star badge on the nose, but not smart enough to realize that they are making a mistake anyway. As much as I despise SUVs, there is something tremendously appealing about this Range Rover wearing a villainous Jaguar maw. The exterior is pretty much exactly what you imagine a modern Jaguar SUV should look like, with a sporty stance and scoops in the front bumper. The interior is borrowed pretty much straight from the newly on-sale XE mid-size sedan. Everything about this should scream parts-bin special, yet somehow because they have added a touch of British-ness to it, it just works. Sort of like how a British accent helps sell the authenticity and credibility of even the most ludicrous idea, only in car form. On stilts. The perennial disappointment that is the Ford Fusion in a couture suit. Lincoln has taken the same platform, but dressed it up with a revised front end that looks more anonymous and derivative than the one it replaces and made some minor adjustments to the rear fascia. The end result would likely have kept this car in its also-ran status, were it not for a huge dose of excitement under the hood. Sporting a brand new twin-turbo EcoBoost motor making 400 hp, the MKZ returns to the market with serious performance chops, but still lacking the brand cachet or the serious luxury accouterments to even be considered in the same league as the German brands. This revision will certainly sell a few extra units to performance junkies looking for a smoking deal on a hell of a sleeper, but will probably fade into a distant memory with the rest of the Lincoln brand soon enough. Another SUV debut, it looks like just a stretched version of the fantastic CX-5. However, the real story is what appears under the hood. 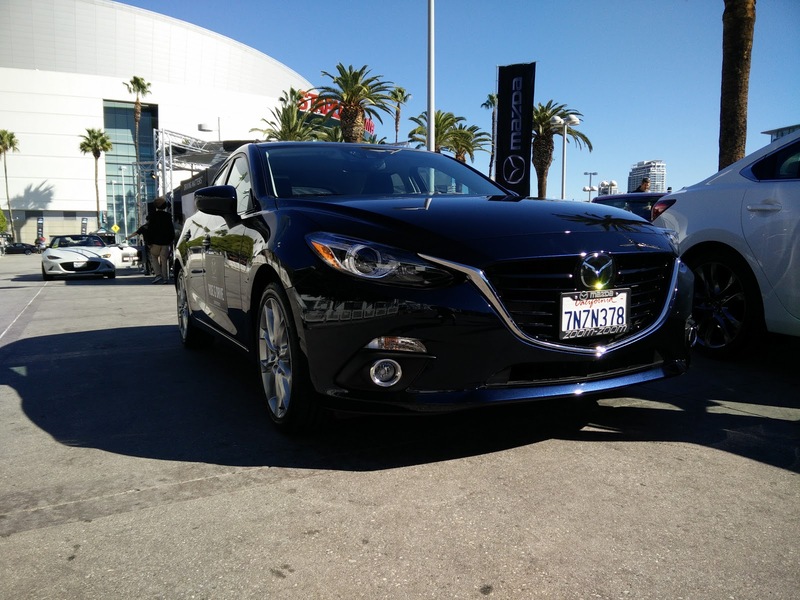 Introducing the first turbocharged gasoline version of Mazda's SkyActiv engine line, the CX-9 may foreshadow some upcoming Mazdaspeed versions of the existing 3 and 6 models. Of course, there is no denying that the CX-9 looks like a great three-row competitor and while it will likely sell few examples, especially compared to the Acura MDX, Mazda should be proud of what it has been able to achieve with its much less plentiful resources. Oh, Subaru! When will you ever learn? You cannot continue to tease us with the fantastic looking concept cars and then come to market with cars so watered down that people question your sanity for claiming that one was derived from the other. Have you not learned anything from the WRX fiasco? All of my bitching and moaning aside, I genuinely hope that Subaru is seriously serious about bringing this concept to market as a mainstream sedan. It looks fantastic and carries many of the cues that made the WRX concept so exciting, but looks like it could actually be feasible for production. Nothing to do now except wait and see. Even though there were quite a few brands outside both West and South Hall this year, we only had enough time to sample the cars outside of West Hall this year. The brands gathered outside the entrance on 12th and Figueroa this year were: FCA (Fiat Chrysler Automobiles), Honda, Volkswagen, Toyota, Lincoln, Mazda, Nissan, and Kia. This year, the manufacturers were really pushing hard to get people to test drive their vehicles, with some of the brands actually giving away gift cards for taking a drive. Here are West Brother's thoughts on some of the cars we drove this year. 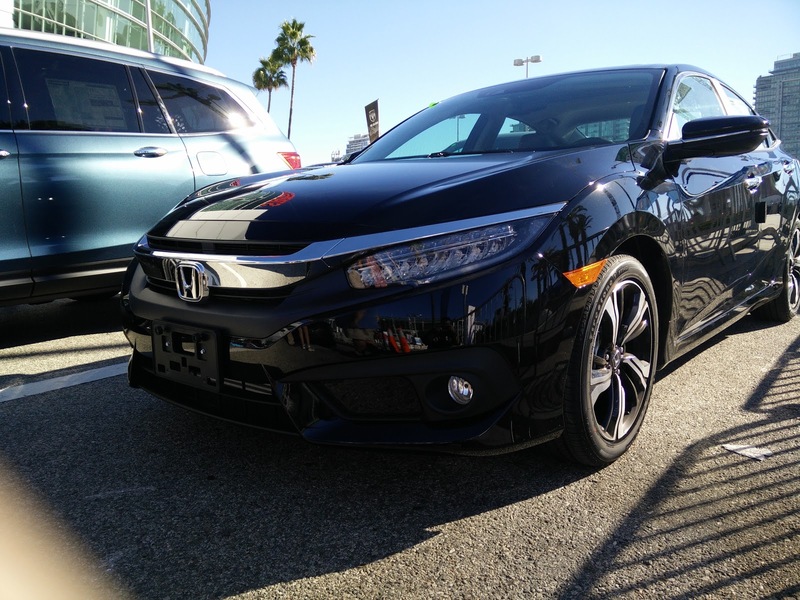 Despite the presence of cars like the 2016 Mazda Miata and the 2016 Dodge Challenger SRT 392, the all new Civic with its 1.5 liter turbo engine was the car I was most excited to test. Honda's all new Civic is already being hailed as the best looking Civic to date, an opinion that East Brother and I both share. The interior of the car is absolutely fantastic. This being the Touring trim meant that this car was loaded with all of the tech equipment and luxury features that Honda could muster, supposedly without stepping on the toes of sister brand, Acura. Sadly, Honda failed in that venture as this all new Civic features technology and entertainment features that handily outclass even Acura's RLX flagship. Obviously, this is great of potential Civic buyers, but bad for customers who have are looking to plunk down $55k on a full-size luxury vehicle from Acura. Out test drive experiences with this all new Civic would be quite different. With my test drive taking place early in the morning, I was able to really get on the car, experiencing the power delivery characteristics of Honda's first forced induction engine available in the United States. Even though boost from the turbo comes in at a relatively low 2,500 rpm, the engine never felt like it lacked power, even without boost. This could be attributed to the CVT, as it did a fairly good job of keeping the engine in the meat of its powerband. East Brother's test drive was dramatically different. With attendees of a basketball game and the American Music Awards crowding the streets during his test drive, traffic outside the convention center became a big issue. However, this actually turned out to be a very educational experience as driving in Los Angeles on a daily basis often means sloughing through stop-and-go traffic anyway. This allowed us to experience how the Civic could handle commuting in LA, along with quick lane change maneuvers. Needless to say, East Brother was quite impressed. Finally, we were both very satisfied with the steering, braking, and handling characteristics of the all new Civic. East Brother and I both agreed that if this Civic with its new 1.5 liter turbo engine had debuted with a six-speed manual, it would be a car we would both definitely consider right now. Rumor has it that Honda will eventually attach a manual transmission to their new turbo engine, but only time will tell. I just hope that the new Civic hatchback set to debut next year will get the manual/turbo engine combination. Honestly, there really is not all that much new to report here. The face lift looks as good in person as it does in pictures. Honda's decision to go with 19 inch wheels was a good one as the wheels look excellent, and match well with the vehicle. From an engine and transmission standpoint, everything remains the same as the pre face lifted model. This is my first time driving a CVT equipped Accord Sport though, and while Honda has done a fairly good job with the CVT programming, it still does not beat the amazing six-speed manual that comes as an option on this car. The only real difference I felt while driving this new model was that the ride feels a little stiffer thanks to the larger wheels/tires, and the stiffer dampers. Still though, it is an excellent vehicle. It was pretty clear that Lincoln really wanted people to test drive their cars. What was the reward available for test driving a new Lincoln? A $20 Visa gift card. Not too bad for driving a car for 10 minutes around downtown Los Angeles. Of all the vehicles available at the Lincoln tent, the only one that was of any interest to me was the MKZ, as it happens to compete in the same class as the Acura TLX. The version of the MKZ available to me was the 3.7 liter V6 equipped "black label edition." Just as with the TLX, the MKZ does not really stand out too much in the looks department. It is in no way a bad looking car, but it just really does not do much for me. The inside of the car is definitely well equipped, and the materials do not feel too bad. Some of the plastic bits could stand an upgrade, especially the buttons surrounding the infotainment screen, which you will be pressing a lot since the left side buttons also happen to be how you change gears in this car. My biggest complaint comes from the position of the entire center console. It sits up relatively high, making the driver's position feel a bit claustrophobic. I was genuinely surprised by the way the car drove. Leaving everything in the normal setting does make it feel like the Lincoln your grandparents probably remember. Set everything to sport, and it transforms quite a bit. Steering and handling feel a bit sharper and more crisp, acceleration is much more brisk, and the engine actually makes quite a nice burbling sound. With 300 horsepower on tap, the MKZ definitely is not a slouch when it comes to acceleration. The fuel economy could use some work though (18 city/27 highway). At the end of the drive, all I could say was that I was pretty surprised with the MKZ. It is still something I would probably never buy, but at least I have a somewhat different opinion of Lincoln now. I have to admit, the Volkswagen tent looked particularly sad this year. With the whole "dieselgate" scandal, as well as news that Volkswagen will be recalling some of their gasoline powered cars for the understating emission levels, people pretty much avoided VW like the plague. As I walked by though, VW was really pushing hard to get people to test drive their cars. Looking at how lonely the VW tent was, I decided to give it a try. Because of all the scandals, the only car VW had out was the e-Golf. East Brother test drove the e-Golf last year, but since I did not get to, I decided to give it a shot. Overall, it looks and feels just like every other version of the current generation Golf I have driven to date. The only difference is the lack of engine noise and vibration. I admit, it was a little odd at first, but I was quickly able to get used to it. Ultimately, I still do not think this is the car for me. I much prefer the way the GTI drives, plus I would not have anywhere to charge the car at home or at work. Also, it is a little strange for one of their own sales people to admit being on the fence about liking the e-Golf for the same reasons I stated rather than trying to sell me on the vehicle. I decided to group these two cars together because the version of the Mazda 3 hatchback Mazda had out, which was the fully loaded, 2.5 liter equipped car, has the exact same engine and features as the Mazda 6 sedan. I have always liked Mazda, and I think they have done a great job with both the 3 and the 6. When it comes to looks, I feel like the two Mazda vehicles are probably the best looking in their respective segments. From a features stand point, both car come extremely well equipped. The coolest feature of both cars definitely had to be the pop up heads-up display. It feels very fighter jet like. Very cool. Both cars drove extremely well. Being the smaller, lighter car though, I much preferred the 3 hatchback over the 6. What I will say though, is the despite how much I enjoyed driving the 3, the all new Civic really gives this car a run for its money. The 3 was often considered to be the best car in its class, but with all the praise being heaped on to the new Civic, it is hard to say whether or not the Mazda will retain its crown. I have not had a lot of experience with Kia's vehicles. The only thing I do know about Kia is that it is the sister company of Hyundai, and that essentially all of their cars share platforms with each other. Up until the Auto Show this year, the only Kia I have ever had the pleasure of driving was the K900. With the lone exception of the extremely low tech back-up camera, the K900 was an excellent vehicle. This time around, I wanted to try something more up my alley. Kia's Optima is the car that competes with the likes of the Honda Accord, and having driven the Accord Sport (and having rode in the Accord Touring V6), it would be good to compare the two vehicles. The version of the Optima available for test drive was the fully optioned SX Limited, which comes with all the tech and safety bells and whistles. Comparing this trim level with the Accord Touring V6 seems pointless as both cars have so much tech and safety, I probably would not know what to do with it. I do, however, like the Optima's leather better than the Accord's. The hand stitched Napa leather just feels that much better than the cheaper leather used in the Accord. When it comes to driving dynamics though, I have to lean towards the Accord. While the Optima's 2.0 liter turbo inline-four is good, it just is not as smooth as the Accord's V6. I also felt like the Accord handled better than the Optima, though the Optima's brakes felt far better than the Accord's mushy brakes. This does not mean the Optima is not a good car. It is actually quite excellent. To be honest, if I were looking for a mid-sized sedan right now, the Optima would definitely be a vehicle that I would happily revisit.